Belt Tightening Leads To Artistic Expansion Tough times can often be a springboard for creativity. When no one's job is safe, no one's house is secure and no one knows exactly what to do about it, artists get to work — and start pushing boundaries. 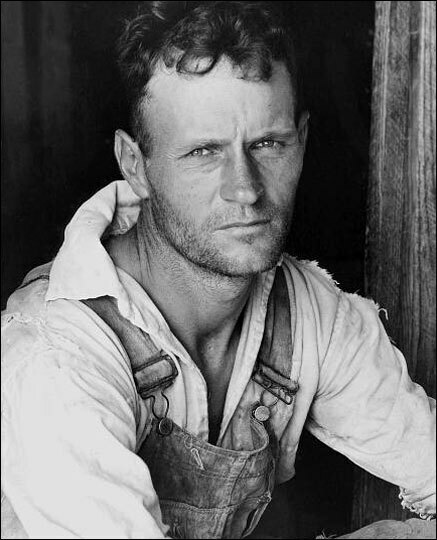 Photographer Walker Evans and writer James Agee cataloged the downtrodden of the Great Depression in Let Us Now Praise Famous Men. Included in the book is Walker's 1935 or 1936 portrait of Alabama sharecropper Floyd Burroughs (above). Two recently released films -- 'Frozen River' and 'Wendy and Lucy' -- seem particularly in tune with the current economic climate. Tough times can often be a springboard for creativity; when no one's job is safe, no one's house is secure and no one knows exactly what to do about it, artists get to work. "That kind of stress often results [in] the need to scream, and art is a way of screaming," says Miles Orvell, an English and American studies professor at Temple University. "Difficult times like the one we are experiencing today can really bring out a kind of expressive culture in an interesting way." This was certainly true in the 1930s during the Great Depression, when artists, actors, writers and filmmakers — some funded by the government — combined curiosity with creativity to find and tell the stories of people affected by the era's economic hardship. 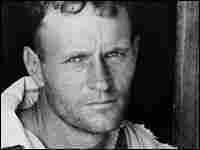 Books like James Agee's and Walker Evans' Let Us Now Praise Famous Men and John Steinbeck's The Grapes Of Wrath depicted life in the Depression in stark terms. And director Frank Capra educated the public about the plight of the needy in his 1936 film, Mr. Deeds Goes to Town, which tells the story of a man who unexpectedly inherits millions and decides to give it away after he is confronted by a desperate farmer. Orvell says that novels and films helped the middle class understand what was happening to those who had lost everything. And these days, even as we are just beginning to adjust to a new reality, there are already some films that provide insight into how this economic free fall is changing lives. "I think that very good filmmakers, like novelists or other artists, have an ability to see a little bit ahead, or to notice things that are happening in the world before they come to the surface," says A. O. Scott, the film critic for The New York Times. The themes of poverty, unemployment and economic distress play a strong role in movies like Frozen River. And, Scott adds, you can't help but think about the collapse of the U.S. auto industry as you watch Clint Eastwood's Gran Torino. But the film that gets closest to the raw fear of what can happen when a person's life begins to unravel economically is Wendy And Lucy, the story of a young woman who has set out for Alaska to find work and gets stuck along the way with no money, no car, no home and no job. Wendy And Lucy "just traces this one young woman's experience," says Scott. "By following that story, [the film] intuited some of the other stuff that was going on. ... And maybe [these films] were the canaries in the coal mine." Being laid off seems to be an almost universal fear these days. And perhaps no one has tapped in to the psychology of layoffs better than author Joshua Ferris in his novel Then We Came To The End. It's a funny and often poignant look at what happens to a group of workers in an advertising agency who live in constant fear of losing their jobs (read an excerpt). Written after the dot-com bust, it could as easily be set in an office today. But Ferris says he really had no idea what was coming. Today's downturn has "materialized in a way that is far more pervasive and far more frightening than anything I experienced in the working world and anything I could have imagined when I was writing Then We Came To The End," he says. Fear, anger, sorrow — a whole welter of emotions takes hold of the workers in Ferris' novel as they watch their colleagues leave the work place for the last time. As fearful as these characters are of losing the economic security their jobs ensure, Ferris says there is something else that is lost when jobs disappear. "The characters lose something that they never knew they had, which was a community," he says. "And I think that's the most ... human aspect of what is lost." But books and films that dwell on the downside of the economy may not be exactly what the public wants right now. During the dark days of the depression, says Scott, audiences flocked to the movies to watch Fred Astaire and Ginger Rogers dance the night away. These days, the public can't seem to get enough of Slumdog Millionaire's rags-to-riches story. Slumdog Millionaire "says the world is terrible, there's poverty and want and cruelty, but it can also be OK — some kind of happy ending is possible," says Scott. "When you are sitting in the theater, you feel the relief this movie offers."